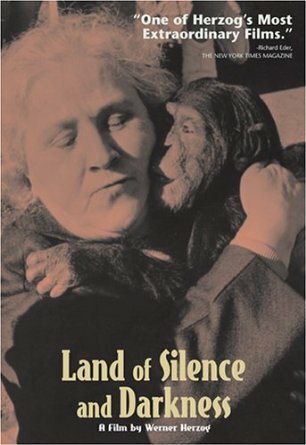 Line from the Film: "When you let go of my hand, it's as if we were a thousand miles apart"
In Werner Herzog’s 1971 documentary Land of Silence and Darkness, we’re introduced to a remarkable 56-year-old woman named Fini Straubinger, who, due to injuries sustained in a fall when she was a child, lived the majority of her life both deaf and blind. Dedicated to assisting others like herself, Miss Straubinger travels from town to town, helping a variety of people deal with the world around them, which many of them can neither see nor hear. Despite its subject matter, Land of Silence and Darkness is, for the most part, an uplifting motion picture, showing us how Miss Straubinger has overcome her handicaps to live as full a life as she possibly can. Early in the movie, we join Straubinger and a good friend of hers as they take their first-ever plane ride, an event that both excites and amuses the two elderly women. But as Herzog shows us over the course of the film, many in the deaf/blind community struggle with feelings of isolation and fear on an almost daily basis. After losing her eyesight and hearing at the age of 18, Fini Straubinger herself spent the next 30 years in bed, immersed in a deep depression, and even though she’s since been able to adapt (Straubinger and those in her immediate group communicate with one another by way of a complex hand-touching technique), we meet a variety of others who have not been so lucky, including a woman who, since the death of her mother, has been in a mental institution, cut off from society. Herzog also follows his main subject to a clinic for young people, many of whom were born deaf and blind and are just now learning to communicate with the outside world. Perhaps most tragic of all is the tale of 22-year-old Vladimir Kokol, who, along with not being able to see or hear, cannot walk, and spends his days entirely alone. Watching this young man sit on the floor of his room, oblivious to everyone and everything around him, is truly heartbreaking. As he’s done throughout his career, Herzog delves deeply into the subject at hand, revealing both the triumphs and tragedies of the sight and hearing impaired. It is both inspiring and painful, lifting your spirits one minute and moving you to tears the next. And like many of the director’s documentaries, Land of Silence and Darkness is an experience you won’t want to miss.